When Richard Nixon visited Beijing in 1972, he ate shaved ice, or bao bing (pronounced bow-BING), with Mao Zedong during a state dinner. Composed of thinly-shaven sheets of ice covered in sweet, Southeast Asian toppings, bao bing is as visually stunning as it is surprising to first-time tasters. Chinese diners enjoyed this icy sweet more than 1,000 years ago, and have since brought bao bing appreciation to Taiwan. Americans began eating bao bing decades ago (one New York Times article discusses the frozen novelty’s “Americanization,” circa 1989). Since then, the dessert has gained fans worldwide, with vendors and chefs often adapting their versions with local toppings. Diners are meant to share bao bing, which is often served in heaping portions, piled high. Traditional bao bing makers often add sweet red beans and condensed milk on top. 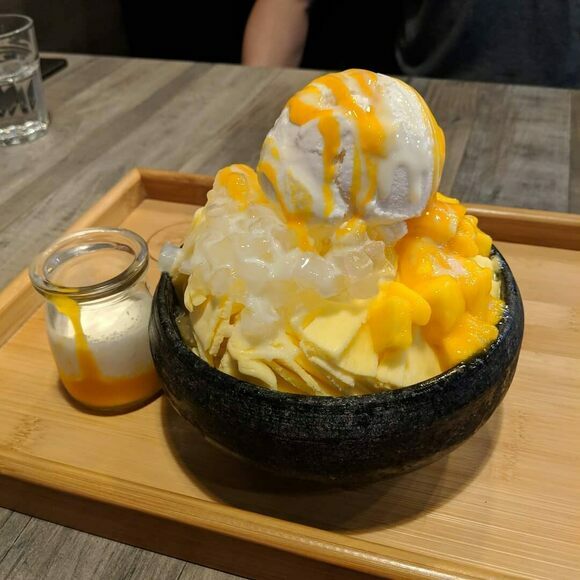 They garnish the outer ring of the dish with fruits such as mango, lychee, and coconut—sometimes fresh, sometimes preserved in syrup. Other popular additions include sugary, chilled peanut or sesame soup, mochi, and grass jelly. In recent years, customizable bao bing shops have sprung up in dozens of countries, allowing customers to choose from a seemingly infinite variety of toppings. Options range from classic Asian ingredients to items one might find atop an American ice cream sundae, such as chocolate syrup and candy. Stall after stall of classic dishes and sweets. This food court in Flushing serves Taiwanese shaved ice, along with countless other Asian specialties. Popular Taiwanese chain that specializes in traditional desserts. A sundae with a surprising mix of flavors that reflect Filipino history. Not even Harry Potter could resist this whimsical British dessert.